This is one of those camping gadgets that is interesting and if you could get used to the change, could be very handy. It’s not something that’s really an option in an area lacking light, but if you have a whole lot of sunlight it’ll save you from having to carry around a constant supply of matches. Plus, unlike matches if something liquid spills in with your camping gear, it can still be used. It’s made of stainless steel and is therefore very durable, so it can handle those harsh conditions. Plus it can be used time and time again unlike other fire starters like lighter fluid. 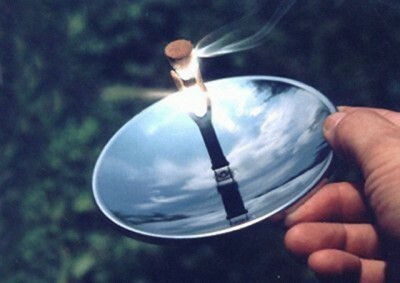 The disk itself uses a parabolic mirror and the shape makes it so the light is focused in a small area. That makes it so that it will catch anything on fire that is between the two prongs. It can even be used for frivolous things like incense. It’s pocket size and can be purchased for $19.95 from Solar Sphere.